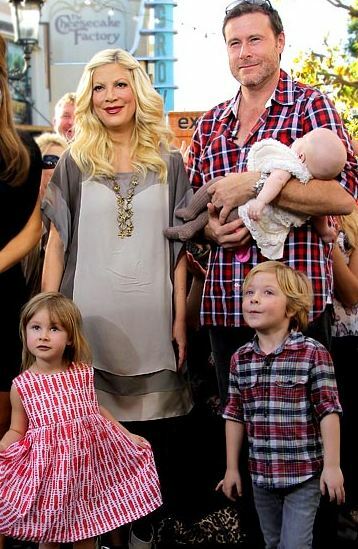 The former 'Beverly Hills 90210' star - who gave birth to the couple's fourth child, Finn, in August - had to spend the last four months of her pregnancy on bed rest or at hospital and she is still amazed by how well her spouse of six years coped looking after their other children. Tori - who also has, Liam, five, Stella, four, and 12-month-old Hattie - said: "Dean's a super dad. He's a mom and dad all wrapped up into one. "He was dealing with so much, but he was always really positive. We had date nights every Tuesday ... Dean would spend the night at the hospital on a cot next to me and we'd talk." Tori was diagnosed with potentially-fatal placenta previa - a condition where the placenta covers the cervix and causes internal bleeding - at 20 weeks into her pregnancy with Finn but Dean remained positive throughout as he knew he had to stay strong. He told Us Weekly magazine: "I couldn't fathom losing the baby or T. I'm perpetually hopeful. T gives me a hard time about it. "T is a warrior with a will of iron - but also the sweetest, cutest thing in the world."